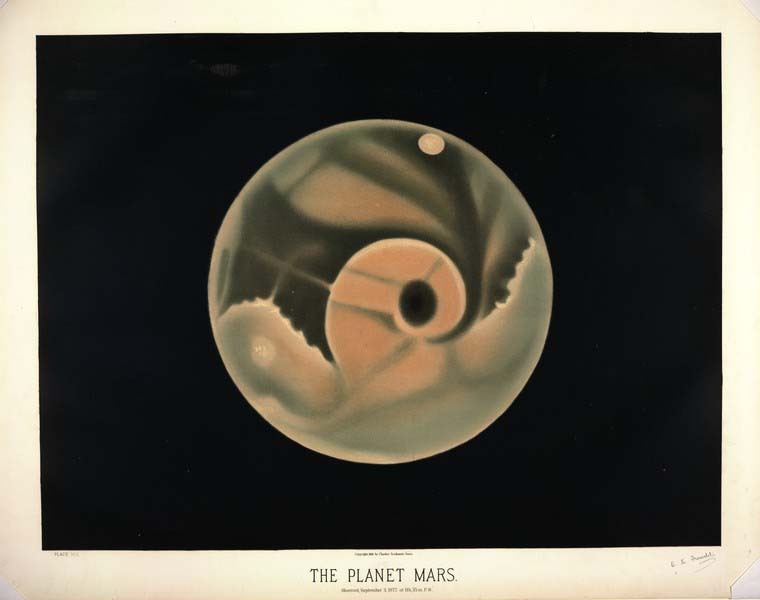 The New York Public Library has digitized and uploaded a gallery of astronomy drawings made in the late 1800s by French artist Étienne Léopold Trouvelot and they are gorgeous. A staunch Republican (of the French variety, not the US variety), Trouvelot fled France when he was just 24 years old after Louis-Napoléon’s December 2, 1851 coup d’état. By the time President Louis-Napoléon Bonaparte had crowned himself Napoleon III exactly one year later, Trouvelot was living in the United States with his family. He settled in Massachusetts in 1855, earning an income as an artist. A member of the Boston Society of Natural History, Trouvelot was an amateur entomologist with a particular interest in silkworms. That interest was more than a minor hobby. By 1865, he had a million Polyphemus moth caterpillars living in bushes in his backyard under a vast net. His aim was to improve the health of the disease-prone caterpillars so their silk production would improve. In aid of this, he had the brilliant idea to breed them with a hardier creature: the gypsy moth. Even in 1868, the gypsy moth already had a reputation as a destructive invasive species. Trouvelot was convinced he could control them, though, so in the winter of 1868/69, he returned from Europe with a clutch of gypsy moth eggs which he put in a tree in the backyard thinking his netting would keep them from spreading. Nature lol’d and with a soft breeze blew the eggs into nearby woods. Trouvelot tried to track them all down but of course couldn’t. He alerted his neighbors and entomologists but none of them did anything. And thus the gypsy moth was introduced to the US. By 1886, his suburban Boston neighborhood was saturated with the beasties. By 1890, the entire state was. The federal and state governments tried to eradicate the pest, but failed miserably. By 1898 the moths had spread south to Virginia and west to the Great Lakes. Today gypsy moths live all over the contiguous US and cause an estimated $868 million of agricultural damage a year. After this mess Trouvelot decided to direct his scientific interests to non-entomological pursuits. 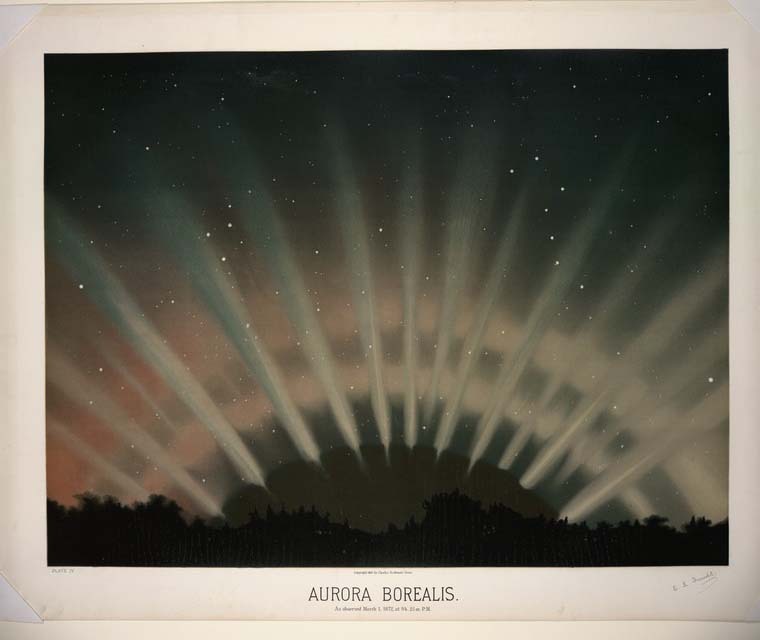 He had already begun to draw astronomical phenomena like meteor showers and auroras in the late 1860s. 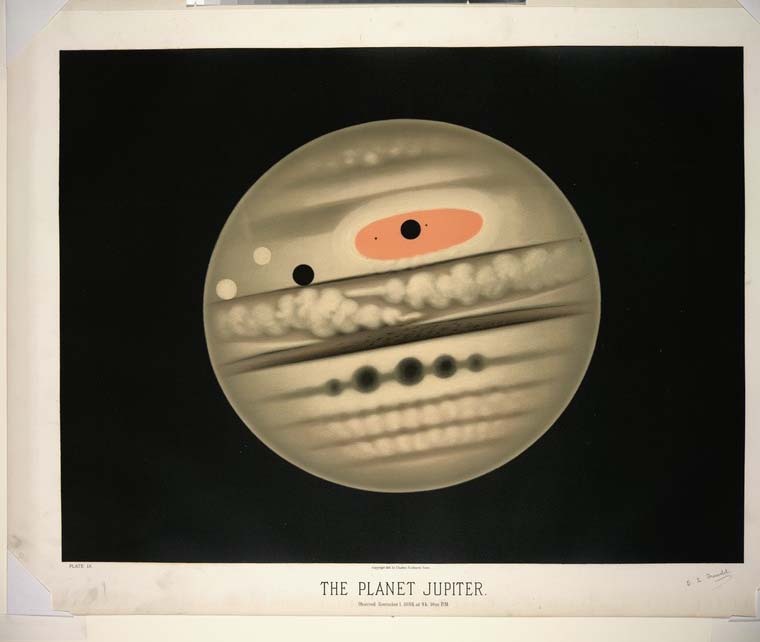 Joseph Winlock, director of the Harvard College Observatory, admired his illustrations and hired Trouvelot to work for the observatory. 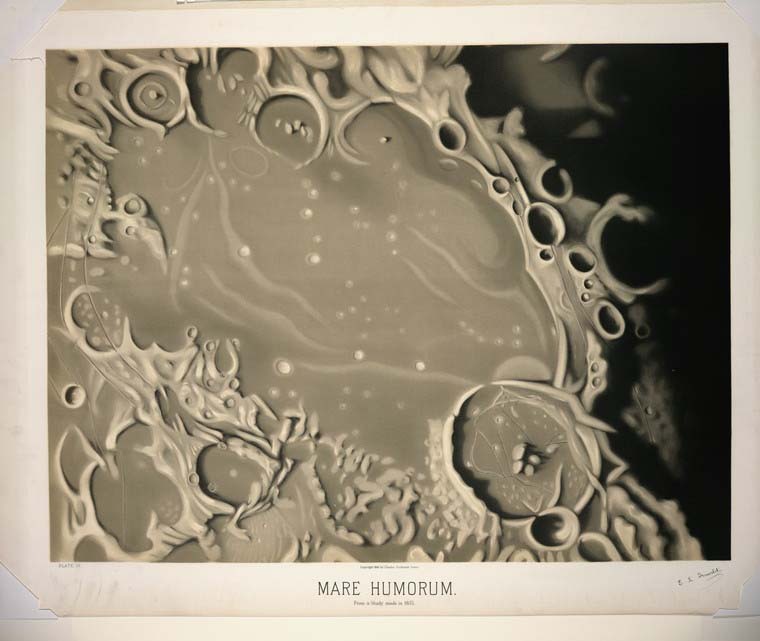 Space photography had existed for a couple of decades by then, but although the technology was constantly improving, drawings were still considered the most accurate depictions of astronomical phenomena. For the next few years Trouvelot made hundred of sketches of what he saw through the observatory’s 15-inch refractor telescope. 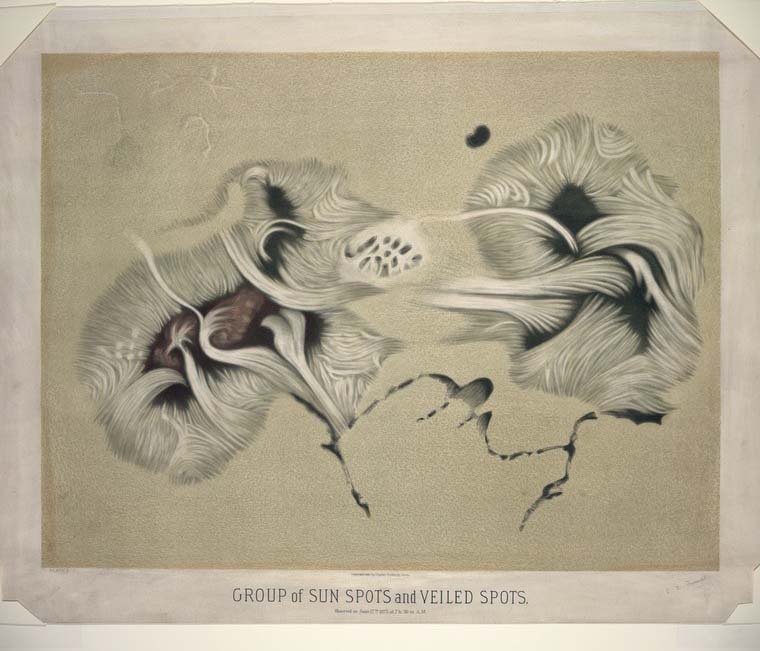 In 1875 he published a discovery of his own: veiled spots, grey patches that look like shadows on the surface of the sun. He then moved on to other observatories, including the Washington Observatory and the University of Virginia’s. 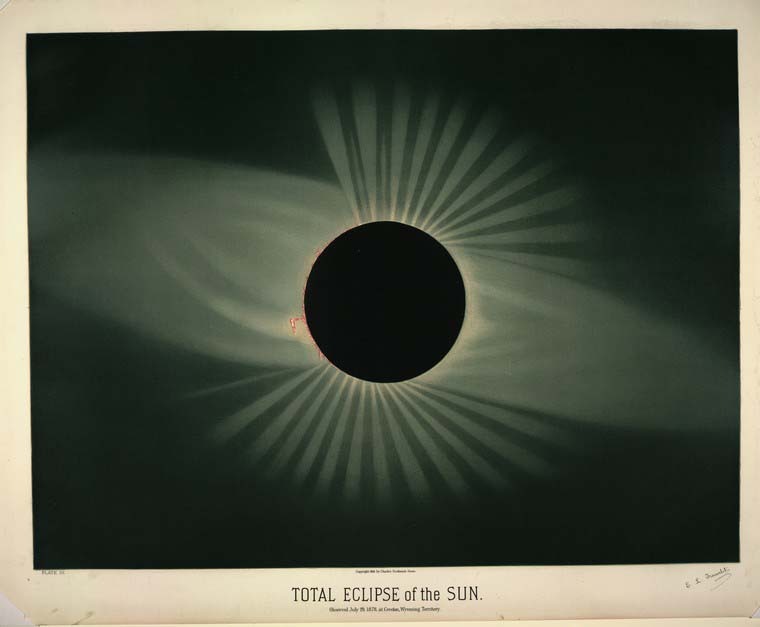 Compare his illustrations to period photography of astronomical phenomena in this NYPL gallery. Trouvelot’s work is far more accurate as well as incredibly beautiful. This entry was posted on Friday, January 13th, 2012 at 11:58 PM	and is filed under Modern(ish), Multimedia. You can follow any responses to this entry through the RSS 2.0 feed. You can skip to the end and leave a response. Pinging is currently not allowed. They would, I agree. They’ve got an almost Art Deco feel to them. Trouvelot’s style was ahead of his time. After the gypsy moth fiasco, I was wondering if his artistic endeavors would lead to some other catastrophe, but alas real life doesn’t always make an enjoyable story. There, there… At least the gypsy moth fiasco is an ongoing catastrophe.